Nightmares are a fickle endeavor. A quick shake of a person, locked in a dystopian dream, can end it altogether. All that’s needed is someone, or something, to enact the disturbance. The latter even made history. For Marquez, last season’s second half showcased a starter worthy of carrying any staff. In his 14 starts to end the year, Marquez pitched to a 2.61 earned run average, striking out 12 batters per nine innings. Both totals, if duplicated over a full campaign, would be the top marks in franchise history. The punchout average would’ve also placed Marquez at fourth in the league, his ERA at seventh. Due to his efforts, Marquez was given a contract extension early this season, totaling $43 million over the next five years. His first start after the pact’s announcement was a far cry from his typical outing. Against the Atlanta Braves, only three days after the contract’s official announcement, Ronald Acuna Jr. and company jumped on Marquez from the start. The final stat line for Marquez was an anomaly this year as he allowed five earned runs over five innings, only two strikeouts to show for his efforts. Looking to rebound from his worst start since August, Marquez orchestrated a milestone appearance. Through his first five frames, he had a perfect game. Following a hit batter to start the sixth, he continued a no-hitter through the first out of the eighth. 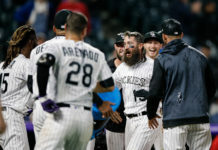 The bid was the longest no-hit effort from a Rockies hurler since Kyle Freeland’s 8.1 inning tally in 2017 and the third-longest in franchise history. “I was just worried about competing out there and throwing up some more zeroes,” Marquez said. Marquez’ day ended with the final out of the game. A complete game, one hit allowed and nine strikeouts summed up a masterful performance from the young right-hander. The one-hit complete game was only the second in franchise history. The complete game effort was the also the first of Marquez’ career, as well as the first leaguewide for the 2019 season. The win was only his second of the year. The reason: a lack of offense. In his two prior starts before Sunday’s outing, Marquez was only given two total runs of support, placing the onus on him to carry the club to a win. The batting order’s performance, only five runs combined in their previous four games, signaled the trend may remain. The long ball ended a streak of 61 fruitless at-bats to begin the year, a streak that was the longest of his career to begin a season. Much like Marquez’ post-contract hangover, Arenado’s struggles came after an offseason that saw him earn the richest contract in franchise history, eight years, $260 million. While the results in the field had been par for the course, at the plate, Arenado was pressing, something he openly admitted to after multiple games. That internal pressure caused his aptitude with runners on to diminish, reducing his impact on the club’s daily offensive performance to only 2-for-11 in high leverage situations per Baseball Reference. Though his three-run home run accounted for nearly all of the Rockies’ offense on the day, it broke a newly-minted barrier for Arenado. The play was just one of many for the first infielder in league history to start a career with six consecutive Gold Glove awards. 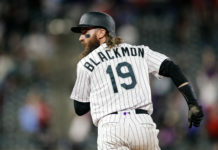 For the Rockies’ sake, they hope their duo has defeated the club’s slumber, opening the floodgates for more.